The Catholic schools of the Diocese of Covington are committed to offering our children a quality education founded on Gospel values while promoting academic excellence and creative thinking in a safe and nurturing environment. When the time comes to step out beyond the doors of our schools, our hope is to have instilled in each student the ability and determination to be spiritually, intellectually, physically, morally and socially adept. Since 1997, the Alliance for Catholic Urban Education (ACUE) has been working with the urban community to ensure that our children within the inner-city areas of our diocese continue to have access to a Catholic education. The six urban grade schools – Holy Cross, Holy Family, Holy Trinity, Prince of Peace, St. Anthony, and St. Augustine- are a vital ministry of the diocese and provide an exemplary Christ-centered moral and academic education to their students. In 2007, Bishop Foys linked the six urban elementary schools under the ACUE Consortium. The Consortium performs administrative and financial functions in order to prevent duplication of expenses, to produce greater efficiency and to study and recommend best educational practices. 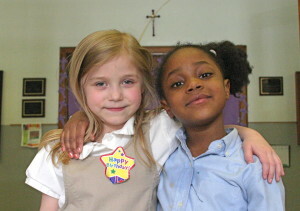 The Urban Schools are a vital mission of the Catholic Church in the Diocese of Covington. These Schools provide an exemplary Christ-centered moral and academic education to the young and provide a foundation that contributes to present and future solidarity and quality of life in the urban areas of Northern Kentucky.